Contact Lenses: Good Looks and Good Fit. Call Today. Atlanta Eye Care will work with you to determine the best type based on your lifestyle and the shape and health of your eye. In most cases, you’ll be able to leave with lenses on the same day as your exam. We’ll teach you how to place the lenses in your eye as well as how to remove them. This is often the most intimidating part of trying contact lenses for the first time. Our staff is patient and knowledgeable to walk you through it all step by step. Our large inventory of contact lenses is commonly prescribed for nearsightedness, farsightedness, astigmatism, bifocal needs, color contacts, prosthetic contacts, and special eye effects for movies. Complementary contact lens solutions, emergency spare-pair lenses, and 24-hour emergency service are offered to ensure your satisfaction with your contact lenses. We emphasize service and many other options to differentiate us from the basic mail order companies. 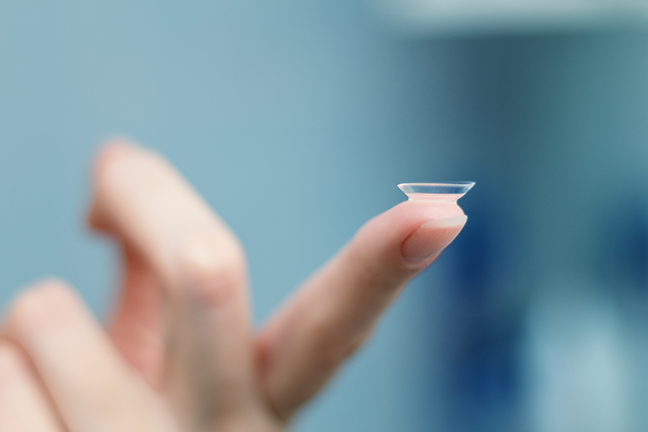 A good contact lens fit starts with a thorough eye exam to ensure the most up-to-date prescription and rule out any pre-existing conditions that could interfere with contact lens wear or put you more at risk for complications due to wearing contact lenses. Our state-of-the-art computerized examination equipment provides very exacting measurements to ensure you maximum comfort and vision. For those patients that have had a difficult time finding lenses that provide good enough vision for their lifestyle, there are RGP or “hard” contacts. These lenses do provide better vision but are usually a bit more difficult to adjust to comfort wise. There are many patients wearing these lenses that are completely happy and unwilling to switch to soft lenses. Another category of lenses that are fairly new to the market are the silicone hydrogel lenses. These lenses can provide many times more oxygen to the eyes compared to other categories of lenses. These lenses are actually providing some patients with a second chance to remain in soft contact lenses. If there is a significant risk of failing ocular health due to lack of oxygen to the cornea, then these lenses may provide the needed oxygen and therefore may extend a patient’s ability to remain in soft lenses. After the initial fitting, we follow up with you and make any necessary changes in fit or materials to give you the best comfort and vision. We teach all our patients proper contact lens care and also possible consequences if proper care is not taken. Then we continue with long-term follow up at least yearly to monitor the condition of the lenses, eye health and to ensure that proper hygiene is being maintained to prevent complications. Scleral gas permeable (GP) contact lenses can help you see more clearly and comfortably if you cannot wear regular contact lenses due to irregular corneas, keratoconus, dry eyes, etc. The lenses are designed to form a new optically clear surface, vaulting over the irregular cornea, then resting on the sclera or white surface of the eye. Scleral GP lenses are extremely comfortable because the lid doesn’t touch the lens while blinking since the lens edge tucks underneath the lids. Most patients report that they can’t even feel the lenses! They are called contact lenses for a good reason. They are in direct contact with your eyes. Therefore it takes a different type of eye exam than the one for glasses wearers. Our state of the art computerized examination equipment provides very exacting measurements to ensure you maximum comfort and vision. A good contact lens fit starts with a thorough eye exam to ensure the most up-to-date prescription and rule out any pre-existing conditions that could interfere with contact lens wear or put you more at risk for complications due to wearing contact lenses. At your initial appointment, you will receive a contact lens evaluation designed especially for those who are switching to contacts. Unlike the annual routine eye exam we recommend for all patients, a contact lens exam focuses mainly on eye-health issues related to contacts. Once that evaluation is completed, the doctor will find a lens with exactly the right amount of curve, thickness and diameter for the patient’s particular vision needs. Next will be your contact lens fitting of the lens to your eye. You will also receive detailed instructions on cleaning, storing, and handling of contacts. Complementary contact lens solutions, emergency spare pair lenses, and 24 hour emergency service are offered to ensure your satisfaction with your contact lenses. We emphasize service and many other options to differentiate us from the basic mail order companies. Our expert doctors provide the most comprehensive range of contact lens services in the area. We have two offices conveniently located in Alpharetta, GA. These offices serve North Fulton County patients, including those from Roswell, Milton, Johns Creek, Duluth, and Suwanee. Don’t take chances with your vision. Schedule an eye exam today at either our Alpharetta Eye Clinic or Windward Eye Care location.